Be the first to share your favorite memory, photo or story of Deacon Rodrigo. This memorial page is dedicated for family, friends and future generations to celebrate the life of their loved one. Rodrigo served in the U.S. Army, he was a veteran of the Korean War, and earned the Combat Infantry Badge. He earned his Master's degree from Southwest Texas State, moving onto serving in school administration. Being an avid sports enthusiast, he coached many teams in his years, both mens' and womens', in baseball, football, basketball, and track and field. He did not only coach, but he was also an athlete himself in all the same sports. Deacon Lozano was part of the first class for the Permanent Diaconate in 1970 in the Archdiocese of Galveston-Houston, graduating in 1975. Upon retiring, he had served 42 years as a deacon in the Archdiocese. He loved his mission ministry, where he served from 2002 through 2018, travelling with the missions to Laredo, Texas, Mexico, and Costa Rica. He was also an author of several Catholic books. Added to his amazing life was his passion for leathercraft, as many who received the fruits of his labor can attest. Rumor has it that he was a dance stand-in for the actor Anthony Quinn in a variety of his films, but we’ll keep that our secret. 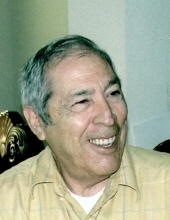 While there were many facets to Deacon Lozano’s life, inclusive of his great sense of humor, ultimately, he was a man who dedicated his life to following God’s Will and bringing Jesus to many as His humble servant. He is preceded in death by Rose Marie Lozano, his wife of 37 years. Also preceded in death by Parents: Rafael and Virginia Lozano; Sister: Raquel Falcon and Brothers: Francisco Lozano, Cesar Lozano, Oscar Lozano and Jesus Lozano. SURVIVING RELATIVES: Children: Rodrigo Lozano II and Teresa Ivarsson; Sisters: Antonia Montemayor, Sr. and Ofelia Lozano; Grandchildren: Apollonia Lozano, Samuel Ivarsson, Emma Ivarsson; Great Grandchildren: Sarah Alvarado, Dylan Alvarado, Derek Alvarado. To send flowers or a remembrance gift to the family of Deacon Rodrigo Lozano, please visit our Tribute Store. "Email Address" would like to share the life celebration of Deacon Rodrigo Lozano. Click on the "link" to go to share a favorite memory or leave a condolence message for the family.